The Black Lives Matter movement is continuing to be a deeply divisive force in America. It is tearing apart race relations and respect for police. Is the Black Lives Matter movement hurting itself? Here’s a great panel on the issue: watch here. Sheriff Clarke says the Black Lives Matter movement promotes false narratives that are used to “emotionally enslave” black Americans, who believe they are victims of racism. But this mentality – and the resulting hostility towards police – further harms the black community. It’s called the Ferguson Effect: Police are reluctant to exercise force because they don’t want to be accused of police brutality, and the result is that crime skyrockets. Sheriff Clarke is angry with the liberal policies that push the black community down socially and economically, break down the black family, and now inflame hostility towards police. 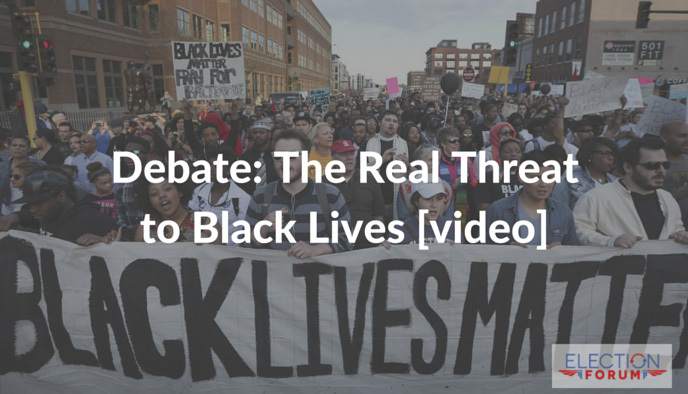 These ideologies are responsible for the biggest threat to black lives: black-on-black crime. Baltimore: There were 32 shootings over Memorial Day weekend, over 60% more than last year. May was the deadliest month since 1972. Milwaukee: Homicides spiked to 180% more than last year. St. Louis: Shootings up 39%, robberies 43%, and homicides 25%. Atlanta: Murders have increased 52% in the first five months of this year, compared to the same period last year. Chicago: Shootings up 24% and homicides up 17% as of May. Houston: Murders went up 45% in the first four months of this year, compared with the same period last year. New York: Murder up 13%, but shootings up 500% in the neighborhood of East Harlem. This shocking rise in violent crime disproportionately hurts black communities. Watch the powerful video with Larry Elder, Sheriff Clarke and Juan Williams here. Crimes are largely committed based on proximity. People of certain racial backgrounds tend to live near one another. Simple research will show that white people commit more crimes against white people, black people commit more crimes against black people, Latinos, and so on. As a Christian, I would ask that you would focus on truth that is easily found, rather than your political viewpoint. Some of the comments in this article are very divisive.